Apricot Almond Balls are a continuum of the previous post on holiday gifting in tandem with Raw Truffle Bites. Pretty Apricot Almond Balls aren’t just for holiday tables and gifting. The moist and satisfying bites are handy paleo friendly treats designed to take the edge off hunger or provide a quick pick-me-up when faced with a mid-day slump. Stored air tight in the refrigerator they will last well beyond a week. Inspired by Apricot Energy Balls at paleogrubs.com. Place the almonds in a food processor and pulse until they are finely chopped. Add the apricot, dates, lemon zest, and coriander and pulse until a dough forms. Roll by rounded teaspoon of dough into small balls. Roll the balls lightly in coconut flakes. There was a time when shipping was a reasonable part of the Christmas gifting equation. I would create schedules for preparing, baking, wrapping, and shipping elaborate holiday gift baskets for friends and family. Often there was a theme; once everything was smoked: from cheeses, to sausages, salsas, jerky, and nuts. As shipping rates escalated, packages got smaller. Now, I’ve pretty much abandoned the whole shipping idea. Instead I turn to Amazon Prime and send something obscure and generic—no doubt these gifts are appreciated just as much as previous crumbled cookies or the occasional exploding jar. This year I really wanted to share my latest discovery of high flavored sweet treats made with raw (paleo approved) all natural ingredients featuring dried fruits, nuts, flavorings, and no additional sugar. Of the two I made, I can’t decide whether I like the chocolate or the apricot more, but it doesn’t matter because they complement each other beautifully. 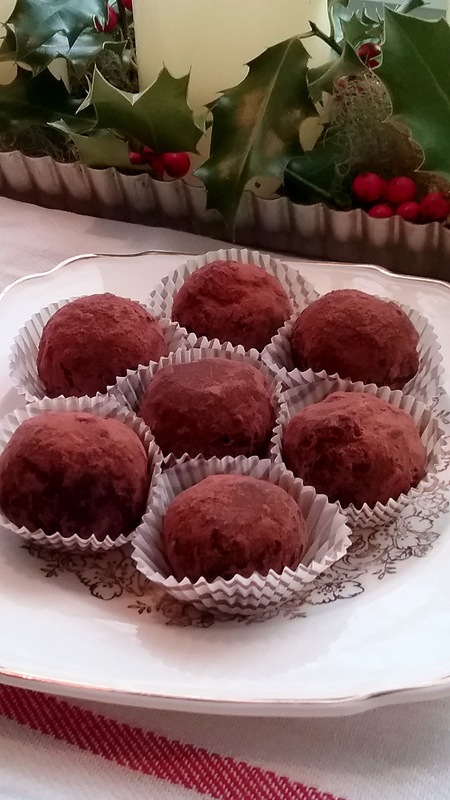 The Raw Truffle Bites have high quality unsweetened cocoa powder, pulverized roasted hazelnuts and Deglet Noor dates, and rolled in cocoa powder. They are a bit like an adult Nutella nugget. 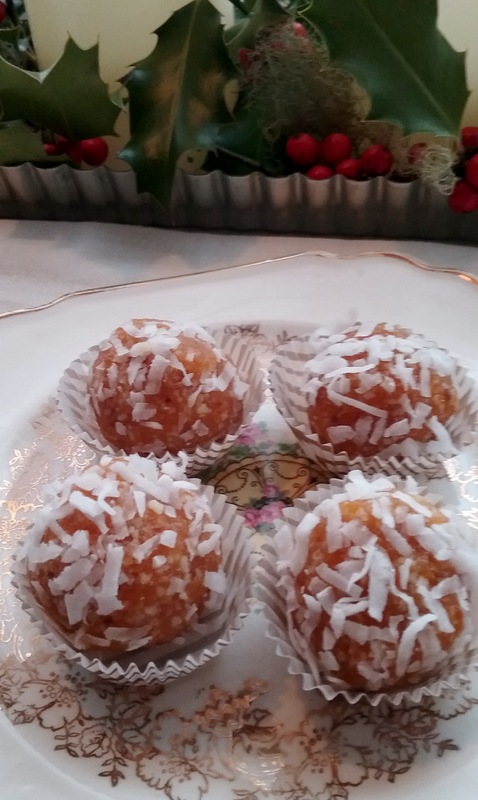 Their companion Apricot Almond Balls, are made with dried apricots flavored with grated lemon zest, pulverized almonds plus a few dates for sweetness, and then rolled in desiccated coconut for contrast. Use the best dried apricots you can find, the lemon zest really brings them to life and the almonds are the perfect counterpoint. You’ll find more on the apricots in my next post coming up. Much like fine bon bons, I reasoned less is more here and the smaller quantities would certainly suffice. Thus, I settled on US Postal Service small flat rate boxes which meant in round numbers, 8.5”x5.5”x1.5” box/postage at $7.00 each; about as reasonable as it gets. Marginally reminiscent of a candy box, it also meant that the box would likely hold only one layer deep. After the complicated packaging of previous baskets this would be pretty straightforward; I was more concerned with the strength of the box to do its job. The raw balls came together in a hurry and in no time I was filling individual candy cups. Next I strategically packed them in colorful beribboned cellophane bags along with gift ingredient labels. The packages were then snuggly bound in bubble wrap and slipped into their waiting boxes—no rattling or shifting here. According to all accounts they arrived safely and fairly unscathed. Add roasted hazelnuts and salt to food processor and process until nuts are finely ground. Add the dates, vanilla, and cocoa powder and process until mixture begins to come together. If necessary, add a couple drops of water at a time. Transfer the mixture into a bowl. Using a slightly rounded teaspoonful, roll with hands into small round balls and chill well. Roll in cocoa powder if desired. Yield: 17 – 20 truffles. Note: These are best eaten cold. Store in airtight container in refrigerator for about 1 week.